According to the IDC, in 2015 the Russian IT services market will grow by an average of 9-10 percent in ruble amounts. There are segments of Russia’s software market which thrive in an export-oriented IT landscape, and exports are growing rapidly. Russian software exports have more than doubled over the past five years, and now total around $7 billion. At the same time, however, demand for IT companies’ products has been falling in the domestic market. Analysts attribute this to a transformation of the Russian market, with demand now shifting from hardware to services. “Here we must run as fast as we can, just to stay in place. And if you wish to go anywhere, you must run twice as fast as that.” This quote from Lewis Carroll’s “Alice in Wonderland” has become a motto for many Russian IT companies these days. The period of boom in the Russian IT market is over. If sales in 2010-2012 grew by an average 20 to 30 percent, sales growth in 2013-2014 was practically zero. According to a forecast by the international analytical group IDC, the Russian IT market contracted by one to three percent in ruble amounts in 2015, compared with 2014. In dollar amounts, the drop is likely to be around 18 percent, to about $30 billion. The contraction of the Russian IT market largely has to do with its structural transformation. Until recently, its most significant segment was made up by hardware, which accounted for approximately half of all sales. The other segments were considerably smaller with IT services and software accounting for around 25 percent each. By comparison, in Western Europe and the U.S. the hardware segment enjoys a far smaller share of the market, not more than 20-30 percent. The preference for hardware is now being “righted” in Russia, too. In unstable economic circumstances, companies buy fewer servers, computers and other hardware. At the same time, falling sales and rising competition push businesses to seek new ways of optimizing costs and improving efficiency. One effective method of tackling these goals is by applying modern IT solutions. As a result, demand for many of them in Russia is now on the rise. The Russian IT services market grew by an average of 9 to 10 percent in ruble amounts in 2015, according to the IDC. There is a growing demand for business process automation software, cloud services, Big Data solutions, outsourcing and business analysis systems. This transformation of demand is prompting Russian IT companies to change the focus of their operations towards new growth areas. In order to just retain their positions, IT companies “must run twice as fast,” as Lewis Carroll said. It is worth noting that as a result of the contraction of the market, many Russian IT companies are now busy looking for opportunities to sell their products and services not only on the domestic market but abroad as well. According to preliminary calculations by Russoft, Russia’s largest association of software developers, the export of software in 2015 increased by 16 percent as compared with 2014. If in 2009, Russian software exports amounted to $2.8 billion, in 2015 they are estimated to have reached $7 billion. Russian IT companies are increasing their presence in the U.S., Germany, Austria and Switzerland, as well as in Brazil, India, the Middle East and China. Russian manufacturers of information security software are becoming increasingly visible on the world market. 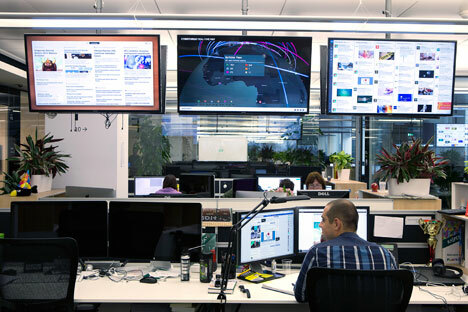 In addition to Kaspersky Lab, which has already secured a leading position globally, the list of rapidly developing Russian companies in this segment includes InfoWatch and Positive Technologies. There are successful examples of sales of Russian IT solutions in the banking sector (Diasoft company), business analysis (Prognoz), call centers (Naumen), virtualization (Parallels) and cloud products (Acronis). Russian companies like Epam and Luxoft are becoming increasingly visible global players in the customized software and IT services segment. Furthermore, Luxoft positions itself as an international concern with its headquarters in Switzerland. In 2016 the overall volume of the Russian IT market is likely to continue to fall. However, companies expect to increase their export sales and to hit the above mentioned growth areas inside the Russian IT market. The government has adopted a number of measures intended to help develop Russian software. In particular, on January 1, 2016 a federal law came into effect restricting the use of foreign software in the public sector. If a state organization intends to purchase foreign software, it will have to first check the new Russian software register that is being compiled. If it turns out that there is a Russian-made solution available, the organization will have to publicly justify why it prefers foreign software to its domestic equivalent.